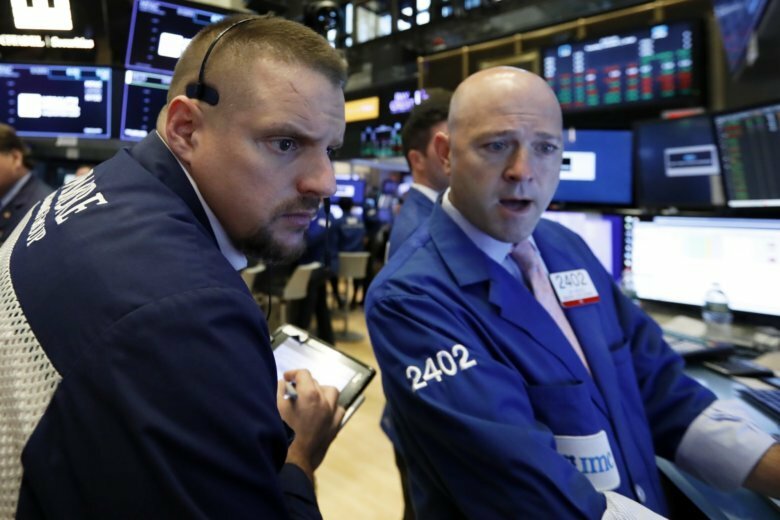 NEW YORK (AP) — Encouraging signs on hiring and growth in the service sector are sending small companies, banks and technology companies higher Wednesday while bond prices are sharply lower. The yield on the benchmark 10-year Treasury note spiked to its highest level in more than seven years. A survey by payroll processor ADP showed strong hiring by private businesses in September, and a trade group said services firms produced more and hired more workers. Both reports suggest the economy is in good shape in spite of rising interest rates, oil prices, and the trade dispute between the U.S. and China. KEEPING SCORE: The S&P 500 index was unchanged at 2,923 at 3:30 p.m. Eastern time. The Dow Jones Industrial Average, which finished at an all-time high Tuesday, gained 37 points, or 0.1 percent, to 26,811. It rose as much as 177 points earlier. The Nasdaq composite added 19 points, or 0.2 percent, to 8,019. The Russell 2000 index of smaller-company stocks climbed 14 points, or 0.8 percent, to 1,670. Those companies, which tend to be more focused on the U.S. market than large multinationals, stand to benefit more from strong economic growth in the U.S. The Russell has fallen since the end of August as investors have grown less worried about trade tensions between the U.S. and other countries. THE ECONOMY: Private businesses in the U.S. added 230,000 jobs in September, according to ADP. That’s the biggest total in seven months. Hiring was strong in most major industries. The federal government will release a report Friday that covers hiring by private businesses and also by governments. A trade group said U.S. services firms produced more, hired more workers, and took more orders in September, and all of those things happened at a faster pace than in the month before. The Institute for Supply Management’s services index rose to its highest level in about a decade. That helped companies that do better when business and consumers are spending more money, like technology and industrial stocks. Apple rose 1.2 percent to $232 and Caterpillar rose 1.9 percent to $157.75. MARKET REACTION: Bond prices dropped sharply. The yield on the 10-year Treasury note rose to 3.15 percent, its highest since July 2011. That helped banks, which are able to charge higher interest rates on long-term loans when bond yields rise. Comerica rose 2.1 percent to $91.70 and Bank of America added 1.4 percent to $30. High-dividend stocks like utilities and household goods makers took sharp losses. Procter & Gamble fell 1.6 percent to $83.01 and Walmart lost 1 percent to $94.14. Investors often treat those stocks as alternatives to bonds, and they tend to fall when bond yields rise. GM FUELS UP: General Motors rose 2.3 percent to $34.06 after Honda agreed to invest $2.75 billion in GM’s autonomous vehicle business over the next 12 years. Honda lost 3.7 percent to $29.33. Japanese technology firm SoftBank said in May that it would pay $2.25 billion for a 20 percent stake in the GM business, which is called Cruise. OVERSEAS: Stocks in Europe rose after Italy’s economy minister backed down on spending plans that would keep the country’s deficit at an elevated level for three years. That relieved investors who were worried about Italy’s debts and the possibility of tensions between the country and the European Union. The FTSE MIB in Italy gained 0.8 percent after dropping 5 percent over the previous five days. Italian government bond prices climbed and the yield on the 10-year bond fell sharply, to 3.30 percent from 3.44 percent. That followed sharp rises in the yield over the past three days. The CAC 40 in France rose 0.4 percent while the FTSE 100 in Britain rose 0.5 percent. German markets were closed for a holiday. HEAVY METAL: Century Aluminum tumbled after Norsk Hydro said it is shutting down its Alunorte plant in Brazil. Alunorte is the world’s largest alumina refinery, and that could leave Century Aluminum without enough of a critical material used in making aluminum. Century Aluminum fell 12.1 percent to $10.46, and shares of Norsk Hydro lost 11.8 percent in Norway. Rival aluminum producer Alcoa, which produces its own alumina, rose 2.5 percent to $42.58. SLEEPING EASY: Tempur Sealy jumped 10.7 percent to $53.55 after Reuters reported that rival Mattress Firm might file for bankruptcy protection as soon as this week. ENERGY: Benchmark U.S. crude jumped 1.6 percent to settle at $76.41 a barrel in New York. U.S. crude has hit four-year highs this week. Brent crude, used to price international oils, rose 1.8 percent at $86.29 a barrel in London. Wholesale gasoline edged up 0.5 percent to $2.14 a gallon. Heating oil rose 1.2 percent to $2.44 a gallon. Natural gas climbed 2 percent to $3.23 per 1,000 cubic feet. METALS: Gold fell 0.3 percent to $1,202.90 an ounce. Silver lost 0.2 percent to $14.67 an ounce. Copper rose 1 percent to $2.83 a pound. CURRENCIES: The dollar rose to 114.34 yen from 113.69 yen. The euro fell to $1.1517 from $1.1545. ASIA’S DAY: Asian stocks fell as traders worried about by rising oil prices and weak economic data in Japan. Japan’s benchmark Nikkei 225 fell 0.7 percent and Hong Kong’s Hang Seng dropped 0.1 percent.